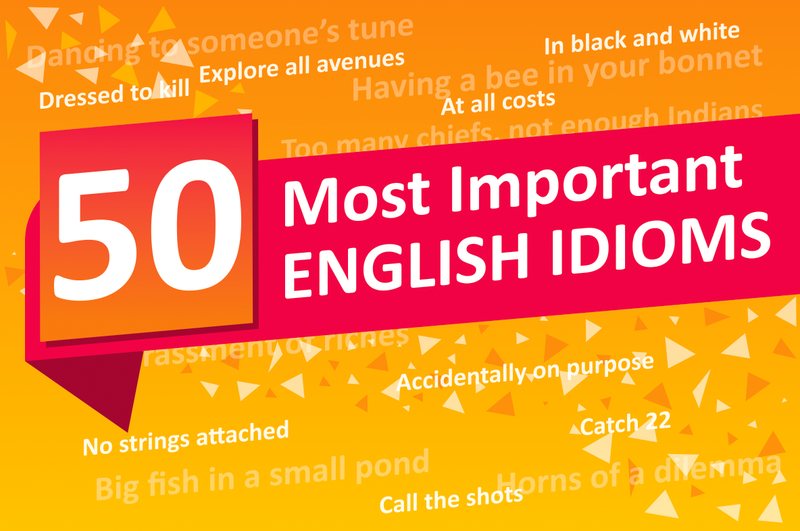 It’s imperative to know the most common idioms because you can’t miss them in conversations. Mastering and learning how to use common expressions will make your English sound more native. Because of their metaphoric nature, people use them to make the language more colorful especially to express something briefly and imaginatively. However, it's important to note that idioms are mostly used in informal exchanges. Adding fuel to the flames means merely doing or saying something that makes the current situation worse. Whenever someone says that they are all ears, it merely means they are so keen. Answering the call of nature means that a person wants to go to the toilet. It refers to when somebody does something deliberately and then pretends that it was an accident. When you badger someone, you nag or pester them persistently until you get what you want. Whenever there are two or more people with different needs, and then you help them settle their scores by making all of them happy, you perform a balancing act. The most likely action to bring success is always somebody’s best bet. Baring your soul to someone is an act of revealing your innermost feelings and intentions to them. This expression refers to the consumption of large amounts of alcohol by young people within a short period. If you are so harsh to someone who a lot to you and they are kind to you, then they can say you are biting the hand that feeds you. When you breathe down somebody's neck, it means that you are having a keen and close eye on them which can make them feel uncomfortable. Clinching a deal is when you reach a specific agreement over some business proposal you had with another party. Whenever people have arguments over something, and they don't seem to reach an agreement, a decision might finally be made on the matter. If the decision is created which is satisfactory to both, then that's a done deal. Whenever you say that something is in black and white, it means that you have proof to show for it. When two parties decide not to have a written contract because they mutually trust each other completely, then that is a gentleman's agreement. There are no strings attached whenever something comes without certain conditions. When you have two or more organizations speaking with one voice, it means that they are in complete agreement on the matter. Whenever you have complete knowledge of something, it means you know it like the back of your hand. Let's say you are weighing a lot right now and you need to exercise to lose some calories to be fit and healthy, then that would mean that you want to get yourself back into shape. When you are healthy again after some sickness, it means you are back on your feet. Whenever somebody is up in arms, they are so angry over something. At times in life, you find people who like discouraging you and criticizing every single thing you do. All they do is see faults in everything you do. You might want to tell them to get off your back. There are things that people do, and they don't make sense to us. We don't care about the effort they make and everything they do is wrong, and you keep telling them so without bothering about what they feel. That means you are biting their heads off. People handle their anger issues differently. When some people are so angry sometimes, it would be advisable to keep off them because they are in a black mood. When somebody's temper comes so sudden, and they get outraged, they are said to have blown a fuse. When you are angered and irritated by someone, you might want to meet them and quarrel or talk to them about it. Whenever you do that, then it means you have a bone to pick with someone. If you do something wrong to someone and then they continuously and strongly criticize you for doing, so it means they have come down to you like a ton of bricks. When men and women are dressed to die they are wearing an outfit that is expensive and fashionable with the intention of seeking attention from others. When you see somebody with an untidy appearance because of neglect or lack of money to buy glamorous clothes, they are merely down at heel. When you see someone who is not appealing to you because of an ugly expression on their face, then it means the person has a face like a bulldog chewing a wasp. This expression refers to older women trying to look younger dressed in clothes for younger people. The phrase applies to a person who has a position of authority in a small organization or company, and they often enjoy being authoritative in those small organizations. Young boys can be mischievous sometimes and they often lack discipline when it comes to some issues. Therefore you might want to force them to behave in a disciplined manner. By doing so, means that you are bringing them to heel. Sometimes when you ask young people to do something for you, they can decline it without reason. But to teach them some lesson you have to stamp some authority by bullying or intimidating them to do it, and it means you will be bulldozing them to do it. In families, the person who calls the shots is the man, who is the head of the family. He or she makes all the final decisions on the matters that arise. He is the one in control. Sometimes when people are given work to do you might find most of them trying to give instructions and mostly the action is at a standstill because fewer people are working. It means that there are too many chiefs, not enough Indians. Cracking the whip means to use your authority by threatening others to follow specific commands or do the work whenever they refuse or become uncooperative. Whenever you are following orders from someone or doing things you are told to do without questioning them, then it means you are dancing to someone's tune. We can do all we can but when it gets to some things we have to slow down a little because there are boundaries established beyond which we will be breaking specific rules which are punishable. Therefore drawing a line in the sand means those actions that go beyond the established limits cannot be entertained. When you force someone's side, you will make them do things that they never intended or planned to do. To achieve something at all costs means that you are willing to get it regardless of whatever you have to go through. To have a bee in the bonnet means a specific idea keeps occupying your thoughts. Something that involves blood, sweat and tears is something that takes more than just luck to do. It requires total dedication and hard work. To have something on your mind means that you have something that you think of all the time. Exploring all avenues is to exhaust all the available possibilities for you to find a solution. Being in a catch 22 situation means to be faced with a situation where you can’t do one thing without the other, and you can't do the second without the first. The embarrassment of riches refers to when it's so difficult to choose because there are many other choices. When somebody is sitting on the fence, it means he or she is faced with a situation which they haven't decided on yet. If somebody is on the horns of the dilemma, it's said that they are faced with two alternatives which are not pleasant at all. Whenever somebody comes to a bad end, it means he or she has done something which is going to be disastrous.